NEMO Sonic 0 Down Sleeping Bag. The Backpacker Editor’s Choice Award Winning Sonic™ has been praised as the only bag you really need from -20 to 40 degrees. 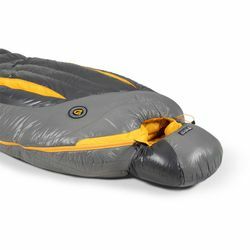 Now updated for 2019 with a redesigned draft collar and draft tubes to create a secure seal against cold air; overstuffed 800FP hydrophobic, RDS certified down; and an updated profile and shaped footbox, the Sonic™ continues to rock out as the King of Comfort from basecamp to summit. The contoured hood with drawstring cord creates maxiumum thermal efficiency, and stretch construction at the knees allows side sleeping. Toester™ footbox is tailored for foot comfort, waterproof/breathable, and includes a layer of synthetic insulation to reduce cold spots. Award-winning design allows for temperature regulation in variable mountain climates. Stretch construction at the knees allows side sleeping. Overstuffed with 800 FP hydrophobic down that is 100% Responsible Down Standard (RDS) Certified ensuring humane treatment and traceability throughout the supply chain. Redesigned draft collar and draft tubes create a secure seal to keep cold air out. Redesigned Toester™ waterproof/breathable footbox relies on an additional layer of synthetic insulation to reduce cold spots. Offset zipper creates a thermally efficient seal. Updated profile secures warmth closer to the body.